On one of my blogs, there used to be automatically generated link posts via Delicious.com. The method was never very reliable, and I abandoned it as it was never updated from its rather basic functionality. In particular, every single link I saved on Delicious.com was re-posted (instead of, say, just the links marked with a “post-me” tag). But I miss the link roundups. So let’s bring them back. Fractal appears in 1975 in Les Objets fractals: Forme, hasard, et dimension by Benoit Mandelbrot (1924- ). The title was translated as Fractals: Form, Chance, and Dimension (1977). These pages, which must have been around for some time, are the work of Jeff Miller. Full of historical, lexical and typographical information and rich in references. Tai, Chen-To: A historical study of vector analysis. I’m reviewing some of the maths I knew 15 years ago (gracious, am I rusty!) and came across this 1995 paper (available as a PDF file),which is even geekier (and certainly more specialized) than the pages in the previous link. It presumes familiarity with the subject of vector analysis as taught to math, physics or engineering students in their first years and covers historical texts mostly from mathematics and electromagnetism with respect to the notation of the derivatives (gradient, divergence, curl), with or without the Nabla operator ∇ (also called del). The author is opinionated and also has a second text, A Survey of the Improper Uses of ∇ in Vector Analysis. Personal names around the world. A short but useful page from the World Wide Web Consortium. 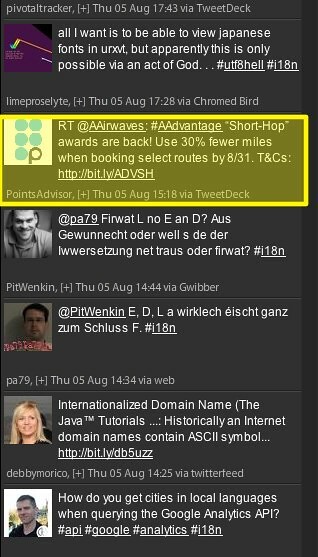 While all the other tweets have to do with multi-lingual software in some sense, the highlighted one doesn’t. It comes from the user PointsAdvisor and re-posts an American Airlines special offer posted by the corporate account AAirwaves. 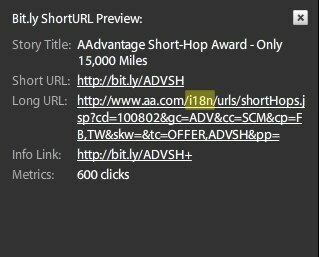 And highlighted, there’s the solution of the riddle: American Airlines uses in the URIs of www.aa.com a path segment (some text enclosed by / characters after the host name) that reads “i18n” — and the Twitter search picks up on this component. Now on the one hand, this is quite bad URI design on the part of American Airlines, but what’s more interesting is that Twitter’s search engine resolves shortened links and includes the target URIs into the search. I didn’t expect this, as the shortened URIs are posted to Twitter as-is. It could be that the search inclusion is a by-product of resolving and storing the full links for security reasons: to protect against malicious code obscured by a link shortener. In any event, the effect may be ephemeral. For the last two days, there haven’t been any new AA tweets in my “i18n” search feed on Tweetdeck (which uses the Twitter API). And on the Twitter page, they seem to have disappeared even from the history. I imagine that the Twitter people have to maintain a number of manually created rules to keep search feeds free of accidental spill-over. 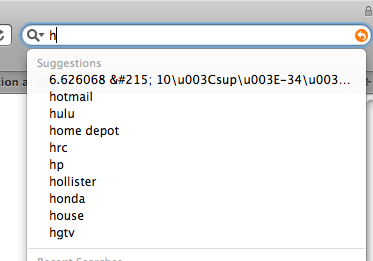 This still does not even begin to address the problem of genuinely ambiguous search terms. Wikipedia lists over 20 senses for “FAI” for example, from Fairbanks International Airport to the French term for “ISP” via the Football Association of Ireland, but a Twitter search for the term is overrun by the extremely common Italian verb phrase “fai”. One thing we can expect is for Twitter and similar services to come up with prioritisation and disambiguation options, which, I’d expect, will introduce problems of their own. \u003C and \u003E simply represent the Unicode code points U+003C and U+003E: the less-than and the greater-than signs < and >. 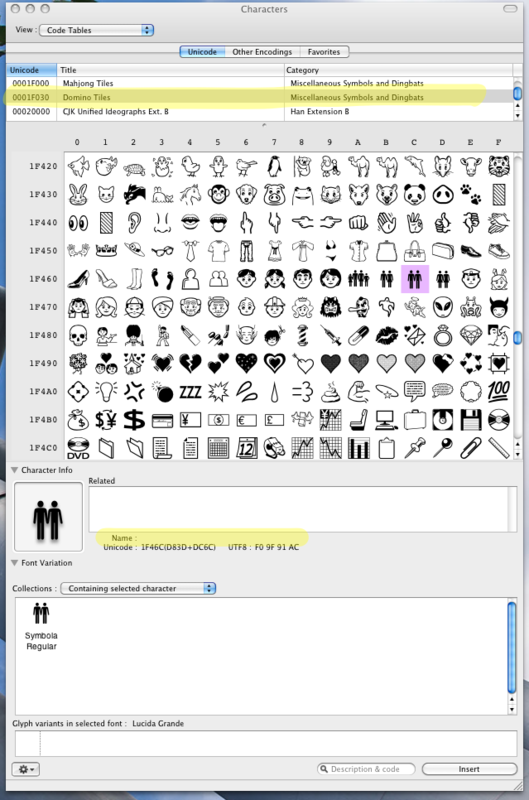 or, completing and resolving the HTML: 6.626068 × 10-34. Once I realized this, my physics training kicked in and the answer to 2. became clearer – Planck’s constant, abbreviated as h, has the value of 6.62606889 × 10-34 J s (or m2 kg / s). 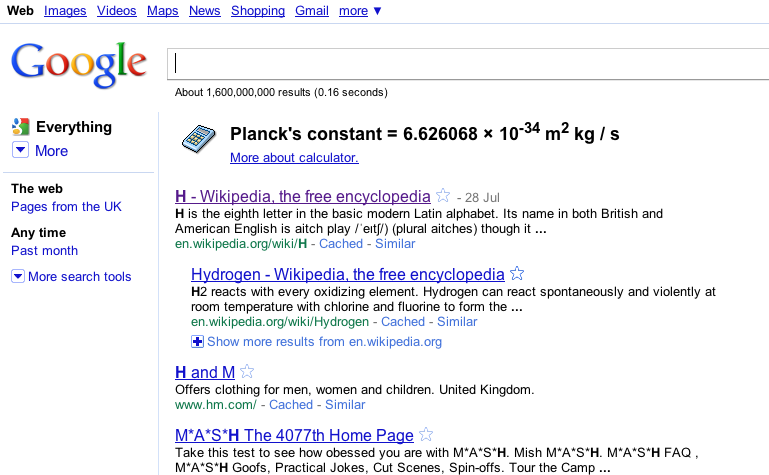 This is not the result of injecting broken text into the search engine results, but a feature of Google’s calculator. Typing “G” into the browser’s search bar also yields similar semi-numeric character salad, while the results for “c“, “e” or “pi” are much more legible. Still, the entire story raises questions about intent and execution. This is not really an internationalization issue because the form of those physical and mathematical constants is largely invariant by convention. Yet, the tools of internationalization — HTML entities, Unicode code point escapes — have leaked into scientific character display, too. Internationalization is a user interface (usability, user experience) issue . On the execution side, Google got it wrong on several counts, and Apple and Mozilla share some of the blame. Browser search bar drop-down lists don’t allow for superscripts and aren’t sophisticated enough to strip markup, so they display ugly raw HTML. Choosing a numeric entity instead of the character × probably led to its display breaking. And < and > are even in ASCII, so they should display fine, but probably security concerns and their status as reserved HTML characters led to the odd choice of escaping method. All in all, at least one decoding step was not carried out. More fundamentally, should Google suggest “6.626068 × 10-34 m2 kg / s” when you type a lowercase h? 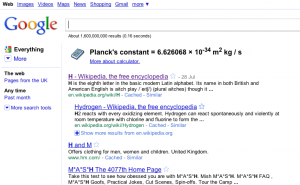 There was a time in my life when I used Planck’s constant daily, and I do use Google’s handy calculator via my browser’s search bar for quick arithmetic and unit conversions. But I think just spitting out the value with no label is going a little too far, and will for more than 99% of users be entirely unexpected: too different from the genuinely useful (for Americans) “hotmail”, “hulu” and “home depot”. Especially considering that for most letters of the alphabet, you could possibly find a scientific constant, function or theorem that starts with it. Though maybe it is a ploy to spread more science among the people. It is also a design issue. The two aren’t mutually exclusive. EDIT (2010-08-02): Commenters inside Facebook’s walled garden have remarked that if you actually take up the suggestion and search for it, you get to Planck’s constant. Currently this is partially right, but these things are constantly shifting: In my tests this morning, whether you use the Safari/Firefox search field or Google’s search page directly, you get a mix of results, the first of which are people wondering about the odd string on SEO forums. A little further down you do get collections of scientific constants, but you have to attentively read the result. Right now, this post is (after less than 12h) number 7 on the results page. None of the pages looks like what you get if you do a Google search for “h” (and hit return) — which is nice and helpful. Another commenter remarks that for her, the suggestion is now prefaced with “Planck’s constant”, which is a vast improvement. The polling stations for the UK General Election 2010 have closed, the exit poll predicts a hung (some call it “balanced”) parliament, a loss of seats of the Liberal Democrats, and a Conservative party only a few seats away from a majority. The first MP has been announced — Sunderland South, a safe Labour seat, but with a swing to the the Conservative party that, if extrapolated to all of England, would probably translate into an outright Conservative majority. As-is, I’m listening to the usual speculations in the absence of hard data, about alliances of the Lib Dems with Labour, or maybe the Tories with the Northern Irish Democratic Unionists. It’ll be a long night. The number on the right has been going up in real-time all day. It is the number of Facebook members that have hit the “I voted” button. This is, apparently, a Facebook feature that is switched on for users from a country during elections in that country, as I learnt after clicking on “What’s this?”. The first interesting point about this is the figure. It’ll probably go up a little further during the evening, and I’ll be curious to see where it ends up. The number of registered voters is given in the press as 44 Mio. If the turnout ends up at about 75%, that means that 33 Mio. people will actually vote. Out of those, nearly 2 Mio. will not just be on Facebook, but engaged enough with this site (or product) to click on “I voted” on election day. That’s about 6%. Not at all negligible. The second point that comes to mind is the surprise that I’m only discovering the feature today, even though it was visible to, and presumably being used by, friends of mine when there were elections in their countries. I may even have voted in at least one of those (the last German Bundestag election). It would be interesting if Facebook managed to publicise at least the results elections internationally through such a tool. As for me, I clicked “I voted”, even though in reality I only voted in the local election that’s taking place today in my borough as well: Being an EU citizen, I am not allowed to vote for UK parliament. Strangely, if I were a UK resident from a Commonwealth country, it would be much harder to live and work here, but I would be allowed to vote. How would you like your temperatures today? French or imperial? In late October last year, I travelled to North America. One leg of the trip was a flight from San Francisco (think sun, palm trees, T-shirt weather) to Toronto. This was my second trip to Toronto, and the first had taken place during the coldest week of 2007, so this time I wasn’t going to be caught unprepared: I consulted the weather forecast beforehand. Online, of course. 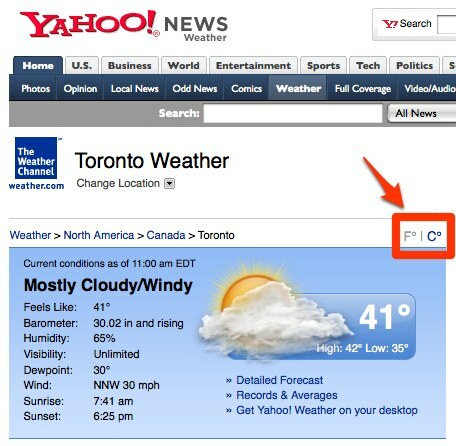 I used two services, weather.com and Yahoo! Weather. English vs metric? Huh. Turns out, “metric” is not entirely off-base: We may be thinking of units of length, area, volume, mass and weight, but degrees Celsius is indeed part of the original metric system. But it’s not the SI temperature scale: that would be Kelvin (not “degrees Kelvin”, btw). But there’s simply no justification for “English”. Maybe they originally used “imperial”, and someone pointed out that degrees Fahrenheit aren’t considered imperial units either. The bottom line: don’t complicate matters when simple does just fine. Posted on January 6, 2009 January 6, 2009 Author chris waiglCategories enTags i18n, usability2 Comments on How would you like your temperatures today? French or imperial?